Kowa recently released another version of their mid-quality binoculars, the BD42s. The new BD42s are designated, XD, to indicate that they are made with Kowa’s patented high-density Prominar glass. In this, they are yet another example of a continuing trend: high quality HD glass (or XD or ED, depending upon the manufacturer) makings its way down into the mid-priced end of the binocular market. What makes this one particularly interesting is that Kowa increased the image quality of these binoculars while dropping the price over 15%! The old BD42 binoculars cost about $590 - $615 (MAP price). The new BD42-XD binoculars go for about $500.00 - $500.00. That got our attention! We were eager to get our hands on these, and when they came in, we wasted little time getting them into the field. The XD stands for eXtra low-Dispersion, and has optical properties similar to those of pure fluorite crystal. You don’t need to know the physics of why. All you need to know is that it dramatically reduces the chromatic aberration that you observe through the optic, resulting in crisper images with truer color and more “pop” to them. But a lot of what is going on with these binoculars is on the exterior of the glass and prisms. Like all high-quality roof prism binoculars today, the BD42XDs are phase-coated, and all glass surfaces are fully multi-coated. Phase-coating ensures a sharper image quality and heightens image contrast. Multi-coating provides optimization of the color fidelity, resulting in brighter truer color. To this, Kowa adds a C3 coating to the “roof” face of the Schmidt-Pecan prisms, resulting in a higher reflectivity of that surface, which also increases the light throughput (the percentage of total light hitting the objective lenses that reaches your eyes) of the binocular. All these treatments provide brighter, clearer and sharper image quality that causes less eyestrain for the user. Lastly, Kowa coats the exterior glass surfaces with their KR coating, which reduces the amount of dirt and dust that adheres to the lenses, and also makes them easier to clean. This is the point where we test how well all that stuff in the preceding paragraph actually works. We tested the BD42-XDs against a wide variety of binoculars that bracket them in terms of price. In terms of brightness, the BD42-XDs fell right in the middle – they were better than some of their competitors and not as good as a select few others. For image sharpness, the Kowas were as good as anything we tested and better than most, though a few tied them in this regard. The BD42-XDs did extremely well in terms of depth of field and chromatic aberration – they were pretty much unsurpassed there. They also had the least field curvature of any binocular in this class. When we measured the useful field of view (the relative size of the sweet spot in the center of the view) the BD42-XDs were better than all but one of the competitor optics. Kowa lists the minimum close focus distance of the BD42-XDs at an even 5 feet. We found that we could coax them a little lower than this. The BD42-8XDs close focused to 4.75 feet, and the BD42-10XDs focused down to 4.66 feet, though in both cases, with a little bit of field collapse at the edge of an individual’s less dominant eye. It is worth noting that the 8x BD has 19 mm of eye relief, which is slightly better than average for an 8x42 binocular; the 10x BD has 18 mm of eye relief, which is quite a bit better than average for a 10x42 binocular. This means that the BD42-XDs should have more than enough eye relief for all but a few users. Optically, we have to rate these new Kowas quite highly on overall optical performance, especially when you factor in the knowledge that some of their competition is notably more expensive. The BD42-XD eyecups adjust with the usual helical twist mechanism: counter-clockwise opens the eyecup up and clockwise closes it down. This mechanism has four stable positions, with two solid detents between the fully open and fully closed positions. The eyecups have a nice beveled surface where they meet the face, leading to greater comfort in use. This is generally all we can ask for in an eyecup. The diopter adjustment is fairly rudimentary: a plastic twist-ring underneath the right ocular. The mechanism does not lock, but the ring is stiff enough to resist most accidental displacement. A raised line on the twist-ring lines up with a similar one on the rubber armoring to indicate the position for equal eyes. There are two additional marks on the armoring that might serve to line the twist-ring up with to mark a particular position for users whose eyes require an unequal setting. 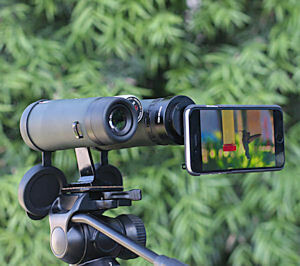 Kowa markets a plastic device that allows you to firmly fix your iPhone to one ocular of the BD42-XDs, allowing you to take pictures through your binocular. Unfortunately, since none of us happen to own an iPhone, we were unable to field-test this device for this review. But it is worth noting in passing that the device is available and that this capability.exists. The rainguard on the on the BD42-XDs is actually a bit better than average. The design features the usual pliable rubber cups joined by a flexible linker, but Kowa made the linker really flexible and the cups really deep, so that the rainguard is easy to put on regardless of the ocular tube position. 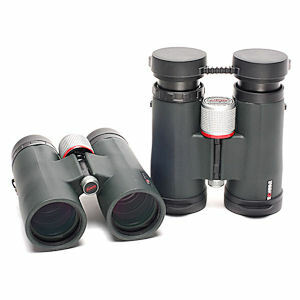 The fit of the rainguard over the eyecups is pleasantly tight, which, combined with the depth of the cups means that it goes on and stays on – even inverting and shaking the binocular failed to dislodge them. The rainguard has a bracket on both sides for threading the strap through; one bracket is gapped so it can be readily detached from the strap and swung out of the way when the binocular is in use. It’s a fine design for a rainguard, simple and functional. The objective lens covers show the same design refinement. They are tethered to the binocular by loops that fit over the barrel ends of the binocular. The fit of the loops is tight enough that they do not readily fall off in the field, a trait that often plagues this type of lens cover. The cups are deep on the lens covers, once again meaning they stay in place until deliberately moved. The tethers themselves are short, but very pliable, and the rubber is heavy enough that they hang straight down, and it takes considerable wind to blow them up in the way of the view. We also noted that they don’t tend to close accidentally when banging against the chest, which is a good thing. The case for the Kowa BD42-XD binoculars is pretty average: it’s just a waterproof cordura case with a flap that folds over the optic and velcros in place. It is generous enough in proportion that the binocular fits easily inside regardless of the position of the hinge or the eyecups. In other words, Kowa didn’t get too stingy with it. The design allows any kind of attached strap to fit out the sides of the flap closure with ease. This is a good, very basic case with no frills, but also no stupid features. The strap is also fairly typical: a black hybrid of leather patches, nylon cordage and soft, pliable padded foam where it fits around the neck. It should be plenty comfortable on a relatively compact 25-oz. binocular. But if you would prefer (and it’s never a bad idea on a full-sized binocular) Kowa makes their own harness type of strap (see it here) which should do a better job of re-distributing the binocular weight on your shoulders and back. Kowa BD42-XD binoculars are roof prism designs, fully sealed and nitrogen-purged to be completely waterproof, and internally fog- and dust-proof. One immediately noticeable property of the BD42-XDs is that they are quite compact for a full-sized 42-mm binocular. 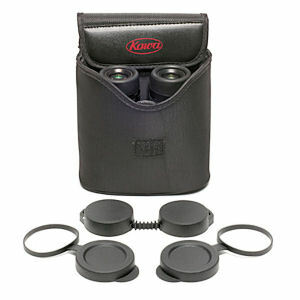 These binoculars are just 5.6 inches tall with eyecups fully extended, and even with the hinge fully open, they are just 4.9 inches wide, both well below average for this class of binocular. 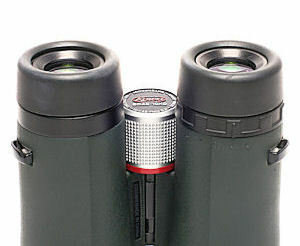 BD42-XD binoculars weigh 25.2 ounces with the objective covers and rainguard included: again, significantly less than average for a 42-mm binocular. The low weight stems from the fact that the internal frames are made of magnesium, which is lighter than the standard aluminum while still being more durable. The main body of the BD42-XDs is dark forest green rubber armoring with mainly black accents. One thing we didn’t much like about them was the aluminum focusing knob and end cap that covers the screw hole for a tripod mounting adaptor. In either a nature-watching or a hunting application, the possibility of light reflecting off this surface is potentially problematic. It’s a relatively minor thing, but still… The rubber armoring has a pebbled surface that feels nice in the hands and provides a secure grip. The action of the central hinge was very stiff, at least right out of the box. This is not necessarily a negative. When the hinge is too loose, you are always adjusting it to restore the proper interpupillary distance for your face. Speaking of which, Kowa BD42-XD binoculars have an unusually broad interpupillary distance range 57-77 mm, meaning that nearly everyone should be able to find a comfortable position with which to use these binoculars. The ocular tubes on the BD42-XDs are somewhat larger than those of the old BD-42s, and there is a comfortable solidity to the package. There aren’t thumb grooves on the new BD42-XDs, but there is a slight ridge that gives a sense of where your hands are on the ocular tubes. Overall, the balance of these binoculars is pretty good, so in terms of their ergonomics, we give them pretty high marks. We mentioned the aluminum focus knob, but not in great detail. The knob’s surface has crenelated rectangular pattern to increase purchase, but not in a way that is sharp or uncomfortable. The focus mechanism was quite stiff out of the box. This is a feature that comes down to taste and trade-off. A stiffer mechanism forces the user to ease into sharp focus, meaning they seldom blow by the point of sharpest focus, and that it holds that focus point against accidental displacement. The caveat is that it is slower and requires a bit more effort. Some may perceive it as not being smooth, which would be wrong – it’s perfectly smooth; it just has more resistance to it. The BD42-XDs require 1.4 turns of the focus knob from minimum close focus to infinity, which is right in the range we expect and like best in a quality binocular. As noted, the minimum close focus distance for both BD42-XD models is 5 feet or slightly better. Overall, we really like these new BD42-XD binoculars. For the first time in the history of the BD line, Kowa has an optic that stands out from the crowd in terms of its performance at its relative price point. They feel great in the hands, and they deliver sharp, bright image quality with low chromatic aberration, great flat field and above average depth of field. We always wondered why people didn’t gravitate to the old BD-42s, which were a very solid binocular at their price. This one is much better, and for less, so if it doesn’t catch people’s eyes, we will be really surprised and a bit dismayed. If you are in the market for a low-to-medium priced binocular, you seriously need to try out and consider the Kowa BD42-XDs.